You are here:Home » Category: "Cassowary Sightings"
Cassowaries caught in the act! It was a very special day at the Daintree Discovery Centre yesterday with some lucky visitors being to treated to the experience of a lifetime – the mating of two wild Cassowaries. Located in the heart of the Daintree Rainforest, 10km north of the Daintree River, the Discovery Centre is a regular hot-spot for viewing wild Southern Cassowaries. It is part of a natural ‘Cassowary Corridor’ and full of gigantic rainforest trees that produce an abundance of rainforest fruits, including one of their favourite foods, the Cassowary Plum. Cassowaries are often observed at the Centre, searching for fallen fruit or drinking and bathing in McLean’s Creek as they try to escape the heat of the day, in the cool understory of the rainforest. 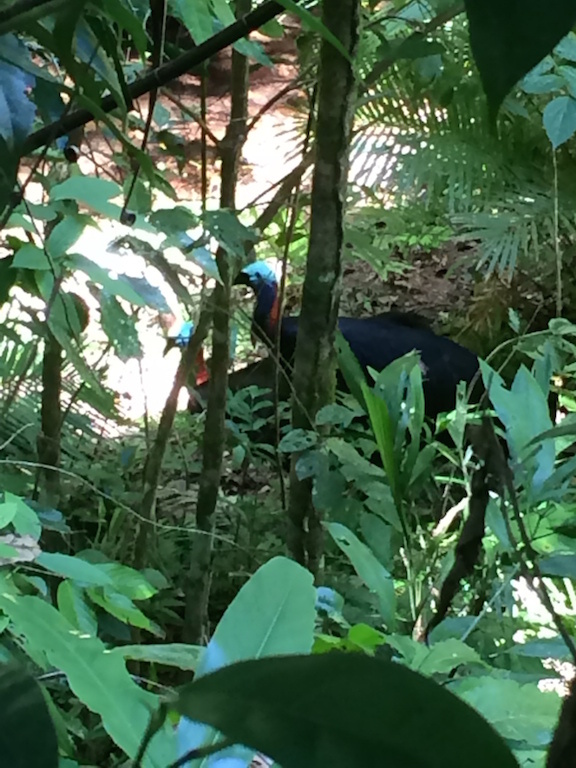 In the early afternoon, word went out that a Cassowary had been spotted and both staff and visitors gathered on the Aerial Walkway to watch a resident male Cassowary and his chick drinking in the creek. (It is the male that looks after the chick(s) until they are about 15 months old). But the main event was still to come! Without warning, a large female Cassowary appeared from the dense rainforest and cautiously approached the male and his single offspring – right underneath the Centre’s Aerial Walkway and in full view of a very excited audience. And she didn’t bat an eyelid! Adult Cassowaries are territorial birds and usually quite solitary by nature. Normally they will only tolerate each other during the breeding season, from June to October. However, staff had recently spotted these two adult birds courting each other, and were somewhat surprised to see the male still had a chick in tow. ‘Cue romantic Barry White music’ . . . and the events that transpired over the next 15mins left everyone gob smacked and scrambling for cameras. To the amazement of the crowd, the huge female settled herself on the bank of the Creek, blatantly inviting the male to mate with her. Cassowaries mating at the Daintree Discovery Centre. A group of around 50 visitors looked on in awe! At first, it was thought they were just courting but to everyone’s amazement the male mounted her – at least three times. The actual number of couplings was a topic of some contention as people jostled to get the best view, but what ever the number, this rare, albeit extraordinary encounter, left everyone speechless. One visitor, Mark Mitton was lucky enough to capture the intimate moments in a series of still shots and was delighted to be able to share them with the rest of the world. Founding Directors Ron and Pam Birkett who were also there, added perspective to the memorable event. The experience comes with exceptional timing as the region celebrates World Cassowary Day this Saturday. Official events are being held in Mission Beach this year (http://www.worldcassowaryday.com). The Daintree Discovery Centre is also celebrating with kids Cassowary face-painting, ‘Cassowary Poo’ Lollie bags, Poster giveaways and more. “It is also a timely reminder for people to slow down on the roads these holidays.” adds Daintree Discovery Centre Marketing Manager, Adam Smith. “If people want to get involved with helping improve Cassowary numbers, they can help provide funding for vital rainforest revegetation projects that provide quality and most importantly, connected rainforest habitats. With Cassowary sightings being recorded every second day on average this time of year, the Discovery Centre allows visitors the unique experience of viewing these wild animals from the safety of elevated aerial walkways and boardwalks, allowing the majestic creatures to go about their business undisturbed. Great footage of a young cassowary cooling down in McLean’s Creek in July 2012. The team at the Daintree Rainforest Discovery Centre managed to film this from the Aerial Walkway. The young cassowary came back the next day for another dip. See footage on our Birds page.